Updated Monday October 1, 2018 by Kitchener Sports Association. PHOTO: The 50/50 draw for the Rangers Fan Appreciation Day was a special affair featuring 100 entries for $20. Fans at the game appreciated the extra chances leading to a season-high prize of $24,440. Connar Mitchell (and his dad) had the winning number and is shown holding the cheque. Congratulations and thanks to all those who have supported local minor athletes through the purchase of 50/50 tickets. A 50/50 draw was held at Kitchener Rangers home games throughout the 2017/18 season and playoffs. Proceeds from the draws were used to support local minor athletes, sports groups, and charities. Special thanks go to all the volunteer sellers for their efforts and to the Kitchener Rangers organization for letting us be part of the best show around. The needs of the local sporting community continue to escalate so we appreciate the ongoing support from the hockey fans at the games. Thanks to all those who supported our draw and congratulations to those fortunate enough to share the proceeds! Specifics on our 50/50 draws effective for the 2017/18 season. Purchasers had to be 18 years of age (or older). These were the first draws we ran that utilized electronic terminals and updated "live" pot tabulations.Ticket prices were $5 (3 entries), $10 (10 entries), or $20 (50 entries). Each purchase included a selection of computer-generated numbers. Tickets were sold before each Rangers home game until just before the end of the second intermission. 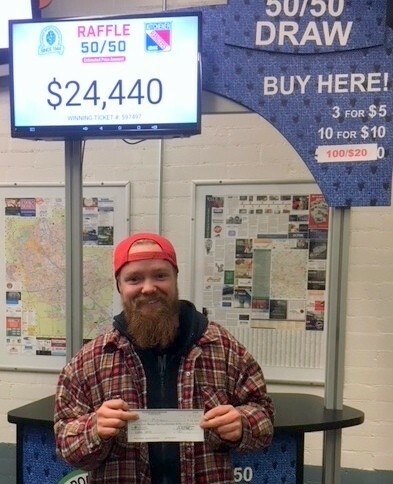 The winning number was drawn during the early part of the third period and announced through the public address system at the Kitchener Auditorium as soon thereafter as time and play permited. All prizes were claimed this year. THANKS RANGERS. IT WAS A GREAT SEASON. ALL THE BEST.